Vice President: John Sudges, Midwest Finishing Systems Inc.
Secretary/Treasurer: Suresh Patel, Chemetall US Inc. In addition to the officers, serving on the Board of Directors for 2018 are: Chris Beninati, Sales Manager, Elcometer, Inc.; John Cole, President, Parker Ionics; Craig Dietz, Product Manager, Axalta Coating Systems; Sue Ivancic, Account Executive, Nordson Corp.; Steve Kiefer, Powder Coatings Business Director, Powder Coatings N.A., AkzoNobel Powder Coatings; Mark Mortensen, President, All-Color Powder Coating, Inc.; and PCI Legal Counsel, David Goch, Partner, Webster, Chamberlain & Bean. Pictured from left to right: Ron Cudzilo, Mark Mortensen, John Cole, John Sudges, Craig Dietz, Sue Ivancic, Steve Kiefer, Suresh Patel, Chris Beninati, Chris Merritt, Paul West and Trena Benson, PCI Executive Director. Formed on May 1, 1981 as a non-profit organization, the Powder Coating Institute (PCI), represents the powder coating industry, promotes powder coating technology and communicates the benefits of powder coating to manufacturers, consumers, and government. 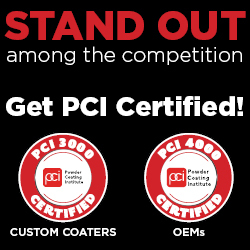 PCI works to advance the utilization of powder coating as an economical, non-polluting and high-quality finish for industrial and consumer products. For more information, visit www.powdercoating.org.